GSMArena team, 07 February 2014. The Samsung Galaxy Note Pro 12.2 retail box uses recycled paper and other than the tablet itself, it features a powerful 2A charger with a detachable microUSB 3.0 cable. There are also spare tips for the S Pen stylus and a metal tweezers-like tool to replace the old tip. The Samsung Galaxy Note Pro 12.2 is from the 2013 phase of Samsung's design - that means a metallic strip on the side accentuating the faux leather back. In terms of looks, the tablet fits in both formal and casual settings. The faux leather material on the back is a soft touch plastic with a leather texture that looks and, more importantly, feels convincing (down to the stitching detail). It's perhaps not as cool as aluminum (for some) but we shudder at the thought of how much the tablet would have weighed if it was made of metal. As things stand now the weight is 753g (for both LTE and Wi-Fi only versions), which is quite a bit to hold in one hand for long periods of time. It's not impossible, but you will be much better off resting your hand against a desk or a table. Then again the same although to a somewhat lesser extent is true for the 10" tablets, so maybe the Galaxy Note Pro 12.2 isn't in too bad a position. The screen bezel is just wide enough to allow a comfortable grip, but again it's not for more than a few minutes of work. Something the size of the Galaxy Note Pro 12.2 was meant to be used propped up on your lap or on a stand. Alternatively, for drawing you can leave it flat on the table like you would a sheet of paper. Samsung chose to put the microUSB port on the right side of the tablet rather than at the bottom, which will make stands more complicated. The two loudspeakers are on the sides of the tablet so docking in portrait mode will cut off one of them. The bigger issue is that the hardware keys move to an uncomfortable position (on-screen buttons would have been better here). Also, some people like large portrait screens (it's comfortable for reading long passages of text) but others don't. Samsung has not announced any docks for the Note Pro 12.2 yet, but there's the Smart Cover that will keep the tablet upright (or at a slight angle). Also, during the announcement at CES, the company showed a Bluetooth keyboard and mouse, which makes for a setup reminiscent of All-in-One computers. To complete the portable workstation, Samsung also unveiled a microUSB to Ethernet adaptor. That's great for places without Wi-Fi (or where it's much more expensive than cable). Speaking of input methods, the S Pen is a trademark of the Note series and uses a separate digitizer layer. It's pressure sensitive (which makes a world of difference for drawing) and can be detected from an inch away (which makes for some interesting hover interactions). 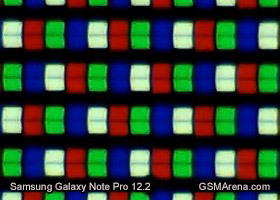 The Samsung Galaxy Note Pro 12.2 has a 12.2" Super Clear LCD display at 2,560 x 1,600px of resolution. Like on the Note Pro 10.1, it's an RGBW display, meaning there are two sub-pixels per each pixel. That makes it easier to boost the brightness in a power-efficient manner (since the White pixel does exactly that), but it affects the look of the display. The pixel density is 247ppi, a bit lower than 10" tablets, which combined with the RGBW matrix results in a visible cross-hatch pattern. It's nothing annoying and text remains sharp even with small fonts and the effect is only noticeable from up close - larger screens are viewed from a bigger distance in general and this is among the largest in the market. Anyway, it's exactly the larger-than-usual screen that makes the Note Pro 12.2 interesting and makes the multitasking so much more powerful. The colors on the screen are vivid and the viewing angles are very good. Samsung has included its custom Screen mode where the Auto Adapt Display setting adjusts the display performance based on the content - it only works in several apps. Other settings include Movie (which sets a warmer white balance and boosts the contrast), Dynamic (which boosts the saturation) and Standard (which aims for accurate white balance and saturation). The screen on the Galaxy Note Pro 12.2 is fairly bright and with good contrast, even though black levels are not perfect. The screen handles reflections well and remains legible even in direct sunlight. We already mentioned the S Pen as one of the trademark features of the Samsung Galaxy Note devices. It works with a second digitizer borrowed from Wacom, which detects only the S Pen stylus. The advantage is that your skin is ignored and you can place your palm on the screen while you're drawing for a more natural, comfortable experience. S Pen offers another advantage too, pressure sensitivity, which is a must-have for drawing. Then there's the ability to detect the S Pen from a distance to show helpful tooltips and activate other features.